Want to win an Apple iPad? Here’s a pretty easy – and creative! – way to do so. This particular segment of The Quest seeks recipes that have an element of the approaching fall season. Consumers submitting recipes can use any of the following iconic fall flavors when making a new drink recipe: Hiram Walker Butterscotch, Original Cinn, Pumpkin Spice, or the brand new Caramel Apple Liqueur. So grab a bottle of your favorite seasonally-inspired liqueur, your cocktail shaker and a bit of imagination. The Quest is now open to submissions on the Hiram Walker website (http://www.hiramwalker.com/recipes/the-quest-is-on) and the Hiram Walker Facebook page (https://www.facebook.com/HiramWalkerUSA) through October 31. 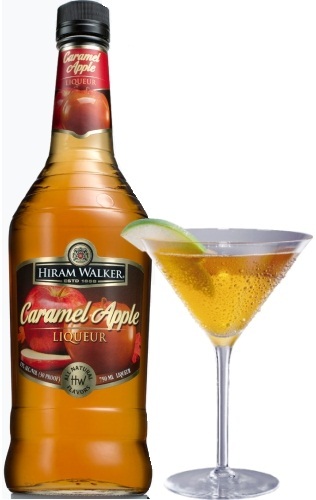 Hiram Walker's newest product, Caramel Apple Liqueur, is now available at retail. A Golden Delicious cocktail is a perfect start to experimenting with the new liqueur. The transition to fall is officially upon us now with the passing of Labor Day, and that means that you can now find Hiram Walker’s newest product, Caramel Apple Liqueur, on shelves at your local retailer. The new product, which will be available year-round, is a perfect accompaniment to ringing in the fall season. We’re thinking tailgates and, dare we say, Halloween (yes, I’ve already seen the bags of candy displayed in one of my local supermarkets) are a few prime examples when a Caramel Apple cocktail may become necessary. Serve up in a cocktail glass. Garnish with an apple slice. In sampling the liqueur, I have found that this recipe also makes for a deliciously smooth shot. To keep things easy, simply split this recipe between two shot glasses. I’ve also had some people reach out to me about a favorite Hiram Walker seasonal flavor and I am happy to answer some of those burning questions. 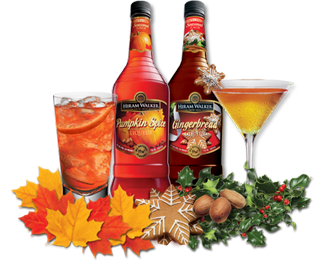 Hiram Walker Pumpkin Spice Liqueur is available now for a limited time only! 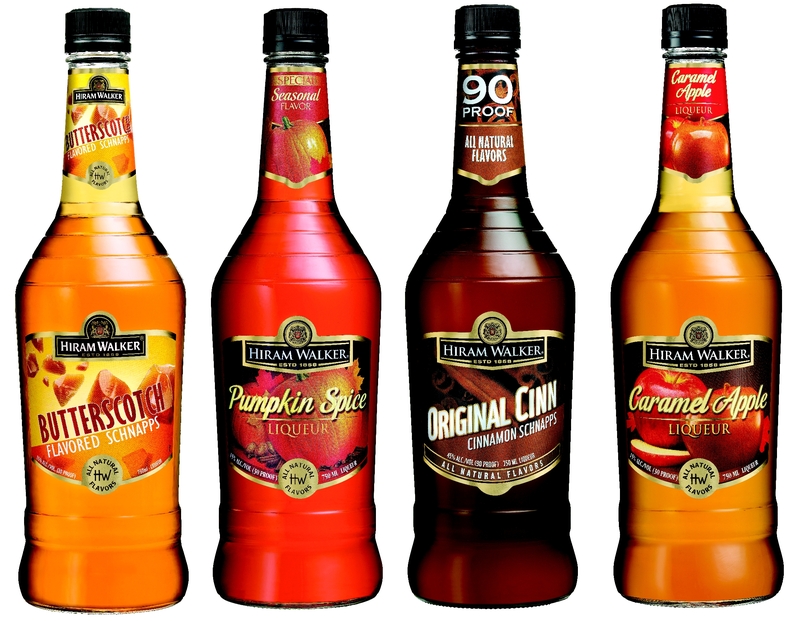 Just as you are likely finding the first of many pumpkin ales and pumpkin spice lattes back on the menus at some of your favorite establishments, you too can now find Hiram Walker’s Pumpkin Spice Liqueur back on retail shelves. However, don’t hesitate – this special seasonal liqueur is available for a limited time only. Whether or not we’re ready, it’s time to embrace fall. I hope you’ll find these, among other Hiram Walker fall flavors, as welcome additions to your back bar at home. Craft cocktail menus continue to reflect unique winter flavors (can anyone say maple syrup?) and January’s issue of Sauce Magazine shares the same sentiment. Pear, honey and rosemary were among those used in the mag’s featured cocktail recipes, but seasonal inspirations like Pumpkin Spice and Gingerbread also got a nod. Combine ingredients in a shaker with ice. Shake vigorously and strain into a martini glass. Garnish with a cinnamon stick. But just as the harsh winter will pass (gosh, I hope! ), these liqueurs, too, will not be on liquor store shelves all year long. Pick up a bottle or two for yourself this month before these seasonal products while you still can. Folks, my sincerest apologies for the large delay in my posting this month. But when I say it’s been quite a busy month, I hope you’ll understand. So back to the theme of the post: the last time I checked, Cocktail Culture’s focus during the months of September and October has been geared towards transitioning your home bars from the flavors of summer to autumn. Leading the pack in the conversation around fall favorites is pumpkin, which will dutifully receive another mention today as we head full steam ahead into Halloween. Ah, understated elegance. A Pumpkin Martini with ABSOLUT Vodka and Hiram Walker Pumpkin Spice. Pumpkin cocktails are to die for (yes, pun was very much intended, I couldn’t help it!) and I know that following my runner-up Autumn in New England cocktail, I’ll be asked to bring Hiram Walker’s Pumpkin Spice liqueur to the Halloween parties this weekend. But goodness knows I can’t bring the same drink; plus, many of my friends have already tried the illustrious cocktail I experimented with. What to drink? What to drink? I could try another variant of the Autumn in New England and serve up an icy Pumpkin Chai (perfect for my social media marketing partner in crime). There’s also the Nutty Pumpkin Martini, incorporating the sweet flavors of pumpkin, caramel, and hazelnut. What other drinks do you plan to stir up for Halloween? Perhaps even those moving outside of the realm of pumpkin? I’ll be sure to provide some of those suggestions tomorrow. In the meantime, go put those finishing (or, in my case, starting) touches on those Halloween costumes. It’s that time of year again…my favorite. The air is crisp, the leaves are turning, there’s apple-picking, pumpkin-carving, and more. I love fall—I just wish it would last longer in New England. Usually we get about 3-4 nice autumn weeks and then— BAM!— it’s absolutely freezing. Enjoy it while you can! Hiram Walker has these great new flavors that are perfect for fall cocktails. Here’s a few that taste fantastic! Combine ingredients in a shaker with ice. Shake vigorously & strain into an Old Fashioned glass filled with ice. Garnish with a lil’ dollop of whipped cream and you’ve got a spicy, tasty treat! Preheat mug. Pour ingredients as listed and stir. Heat it up in the microwave for 45-60 seconds until nice & hot. Garnish with a cinnamon stick and an orange corkscrew. Warm and delish! Preheat mug. Pour ingredients as listed and stir (if you’re ridiculous like me, add some sugar). Top with whipped cream and a sprinkle of nutmeg. Sip on this while you’re serving up candy to those trick-or-treaters. Yum! Check out the HW recipe database for more and keep these on-hand for the holiday season. By the way, there’s a little Gingerbread Liqueur cocktail recipe contest that’s underway among cocktail bloggers so I’ll keep you posted on what fabulous concoctions they create. Cheers!